Groups worked for four half days carrying out research, constructing information posters for our public exhibition which was held on the afternoon of Monday the 20th of June. Children guided visitors through the exhibition and discussed the contents. 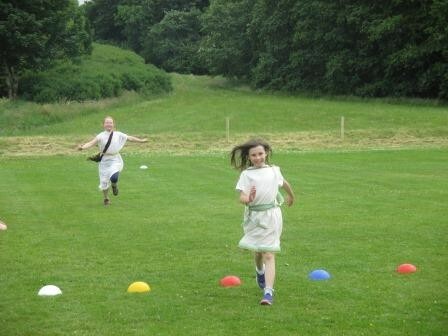 In the afternoons the Primary 4 to 7 practiced different Olympic Sports similar to those the Ancient Greeks would have done. There were 7 different events Shot Put, Javelin, Discus, Long Jump, Sprint and Marathon. They practiced each of these to see which ones they were best at and then they entered these events on the school sports day which was held on the Thursday the 16th of June in the afternoon. On the sports day the school was played down to the pavilion by our wonderful Primary 4 and 5 Samba Band. 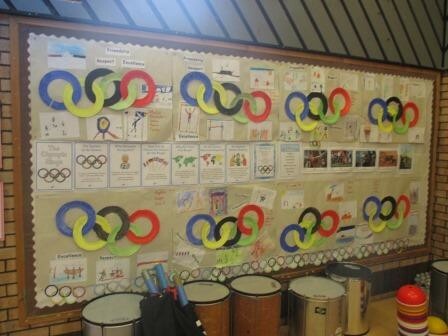 All the Primary four to seven children had dressed up in traditional Greek Olympic outfits that had been designed and made by the children as a homework task. There was also a completion to design the Olympic Torch there was a winner from each year group and this was carried down at the front of each class.